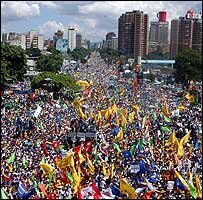 BBC NEWS: "Tens of thousands of people have marched through the Venezuelan capital, Caracas, in support of the main opposition candidate, Manuel Rosales. Mr Rosales will face President Hugo Chavez in December's presidential poll. The march, which filled the main avenues of the city centre, was the biggest opposition rally Venezuela has seen since early 2004. Then, protesters made an unsuccessful bid to oust Mr Chavez from power in a recall referendum."